We recognise that investing in Tempur is a big decision. We are confident that our products will make a different to your life not just today but for many years in the future. This is why we offer an extended manufacturer’s quality guarantee for FREE! In the unlikely event that you experience a genuine issue with your TEMPUR purchase, we are here to support you. Who offers the TEMPUR Guarantee? EMPUR products are individually processed, therefore minor variations can occur. The Manufacturer warrants that all new and genuine TEMPUR products are free from material defects due to faulty workmanship or materials for the applicable guarantee period (see section - For how long?) unless the product is specifically excluded or an exclusion applies (see section - Exclusions). The TEMPUR Guarantee is valid for products purchased by consumers anywhere in the world (except the USA and Canada) from the Manufacturer or an authorised retailer for personal use and not in the course of a business, trade or profession. A list of authorised retailers is available at tempur.com, or visit our store locator for UK suppliers. 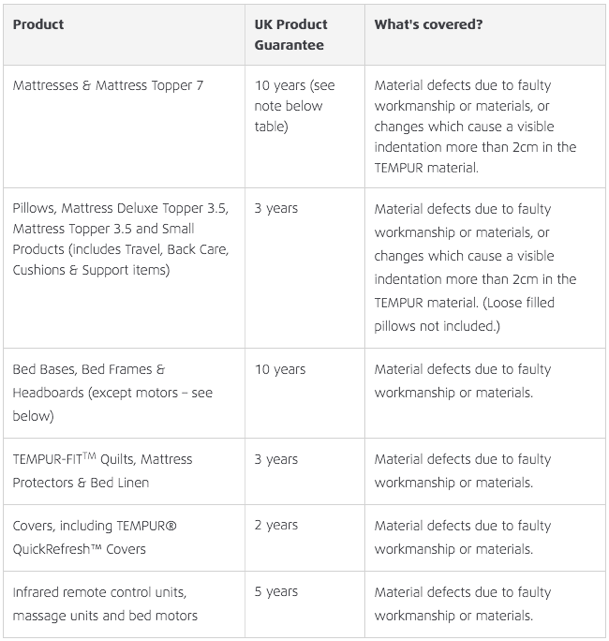 From 19.05.2016, for purchases made within the UK, the TEMPUR Guarantee lasts for the period displayed on or inside the packaging of the relevant product, or as stated on uk.tempur.com, starting from the date of purchase (except where the product is an ex-display or demonstration model in which case the guarantee starts from the date of manufacture). The guarantee period is generally as set out in the guarantee table, however if not bought within the UK, the Manufacturer advises that you should check the guarantee terms for the country in which you originally purchased your product as there may be a different guarantee period applicable. **The price of the replacement item will be subject to the price published in the Manufacturer’s guide pricelist in force in the country at the time, when the claim is made. Where a valid claim is made in accordance with this TEMPUR Guarantee, the Manufacturer shall offer, at its choice, either to repair the defective product or provide an equivalent replacement product free of charge. The Manufacturer will refund the reasonable delivery cost of returning a defective product for repair or replacement so long as the claim is valid under the terms of this TEMPUR Guarantee and the product is returned from an address within the same country as the authorised retailer the product was purchased from. The repaired or replacement product will be delivered free of charge to an address within the same country as the authorised retailer the product was purchased from. In all other circumstances, any delivery costs associated with any repairs or replacements are the purchaser's responsibility. • the process for making a claim under the TEMPUR Guarantee (set out under the heading "How do you claim under the TEMPUR Guarantee?" below) has not been correctly followed. • the product has not been used and/or handled with due care and/or in accordance with the instructions of use, cleanliness and maintenance available at uk.tempur.com, and/or per the booklet enclosed with your product. Please make sure you retain them. • the product has been deliberately damaged or damaged as a result of neglect, cuts, burns, flooding or any other improper use by you or by any third party. • the defect is caused as a result of the product having been bent, squeezed or exposed to cold temperatures for a period of time causing the material to tear or permanently deform. • the product is found to be very stained, soiled and/or otherwise unhygienic. • the product has been altered or repaired without the Manufacturer’s prior permission. • adjustable bed bases have been overloaded or misused against the Manufacturer's weight restrictions. • the defect is the result of normal wear and tear. • zips on the cover of TEMPUR Products unless faulty upon receipt of product. • slippers, we do not offer extended guarantee on this item. • for mattresses, pillows and small products (within the range of CE marked products), the defect or change in the product is only a minor variation or normal change which does not affect the pressure redistributing properties of the product. How do you claim under the TEMPUR Guarantee? • contact the authorised retailer you originally purchased the product from (the “Seller”). If the Seller is either no longer in business or is no longer a TEMPUR authorised retailer, please contact the Manufacturer. • present the original invoice or sales receipt as evidence of the purchase. • have correctly completed the TEMPUR Guarantee certificate given to you at the time of purchase or the online form available at uk.tempur.com. Please register your TEMPUR Guarantee as soon as possible after your purchase. • return the product to the Seller or to the Manufacturer (but only if the Manufacturer has requested the product). If the Manufacturer determines that the claim is valid in accordance with the terms of this TEMPUR Guarantee, you will be refunded the reasonable delivery costs for the returning the defective product so long as the product has been returned from an address within the same country as the Seller. Many TEMPUR products are CE marked as medical devices class 1, for prevention or reduce risk of developing pressure ulcers, which means that the properties of the product meet the requirements of directive 93/42/EEC. Please check the washing label to see whether the product you have purchased is CE labelled. The liability of the Manufacturer is limited to the cost of repair and/or replacement of the product under the TEMPUR Guarantee. Accordingly, the Manufacturer will not be liable for all other liability for loss or damage howsoever caused arising out of the purchase, possession, sale or use of the products. However, the Manufacturer does not exclude or limit in any way its liability for death or personal injury caused by its negligence, or fraud or fraudulent misrepresentation. The TEMPUR Guarantee does not affect a consumer’s statutory rights under applicable law but aims to enhance the consumer’s rights where applicable. Finally, we’ve said it before, but don't forget to register your guarantee.